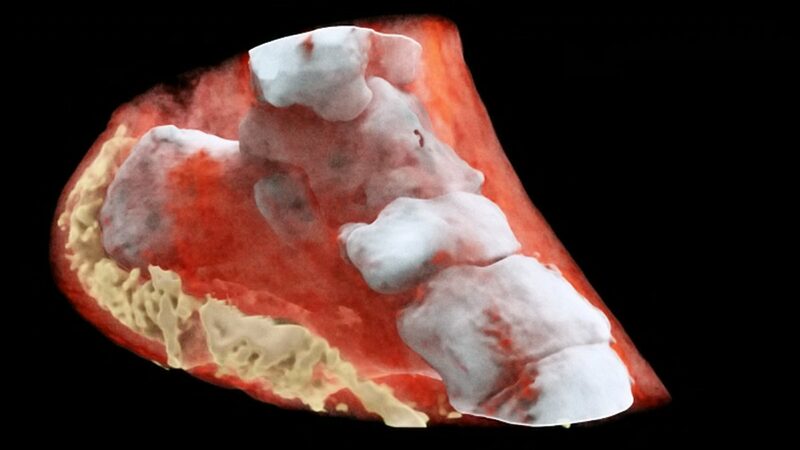 Doctors could spot deadly diseases including cancer without surgery thanks to pioneering 3D X-ray technology – which produces colour images of the human body. 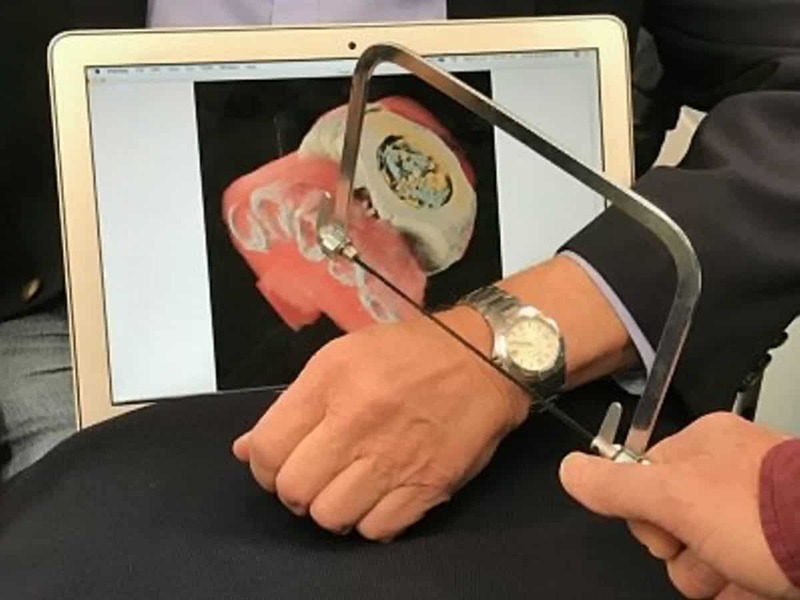 The MARS small bore spectral scanner produces clear images of the human body which could lead to more accurate diagnoses and be used to spot signs of osteoarthritis, atherosclerosis and cancer. 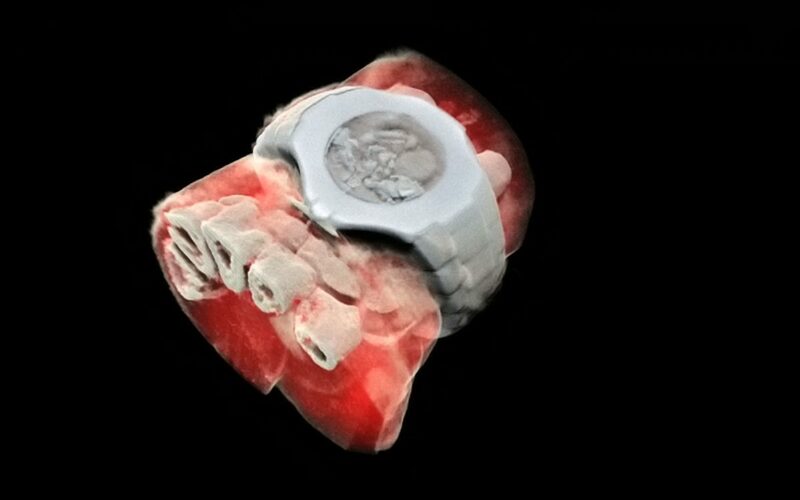 Fascinating images include a wrist X-ray showing red muscle tissue and 3D bone structure and even a white watch and watch strap. Video footage reveals a rotating 3D scan of an ankle scan, skin and cartilage in beige, soft tissue and muscle in red and bone in white. While traditional CT scans struggle to produce imaging close to metal objects due to streaks and ring artefacts, the MARS human scanner can also produce X-rays with reduced metal artefacts which allows closer examination of nearby tissues. Scientists in New Zealand spent a decade building and refining the medical scanner which uses chips for particle imaging and detection. Steven Gleseg, an associate professor at the University of Canterbury in New Zealand, said: “A number of applications using spectral CT have been developed on the MARS small bore system. “The first applications to be translated human imaging are likely to be the assessment of osteoarthritis and imaging around metal implants. Using the machine, patients lay on a bed with a rotating X-ray tube and rotating MARS camera – which can scan objects up to four inches wide (100mm) and 11 inches long (280mm) including feet, ankles, knees, wrists, hands and necks. The MARS camera is made of unique detectors that use pixels to count particles in the body and enable spectral imaging in the human diagnostic energy rate. The Medipix3 technology, developed at CERN, works like a camera, detecting and counting each individual particle and hitting the pixels when its electronic shutter is open. It produces high-resolution, high-contrast and very reliable images, making it a first for imaging applications in the medical field. The scanner is designed for use in any lab and is fully shielded for radiation protection and comes with double circuit safety interlocks, on-light, and an emergency stop. Chair professor Ge Wang, from the Rensselaer Polytechnic Institute in New York, US, said: “My lab is blessed to have the latest MARS photon-counting micro-CT scanner. Doctors can use the spectral CT scanner to identify tissue cell types and can be used to research health conditions such as fatty liver disease, atherosclerosis and obesity. Scanners can be placed hard up against walls and are controlled by an easy-to-use graphical user interface which controls the scanned area, the camera settings and energy thresholds and parameters such as the number of image frames per rotation. MARS Bioimaging Ltd (MBI) is an award winning manufacturer of small bore spectral CT scanners for pre-clinical medical research. The company was formed in 2007 and includes teams of physicists, radiologists, engineers, computer scientists, orthopaedic and other surgeons, mathematicians, biologists, and cancer researchers.